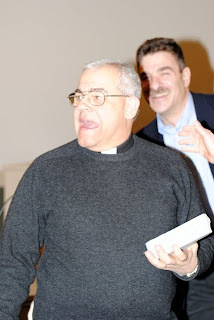 Father Bob Couto, pastor of St.
Citizen of the Year on March 7. LONDONDERRY -- Some of the town’s finest citizens had their moment to shine Monday evening when members of the Town Council presented the town’s annual Volunteer Awards. This year’s Volunteers of the Year are Joel Sadler, Maureen Pauwels and Kerri Stanley. “This award is what the fabric of town is really about,” Councilor Mike Brown said. “The majority of what’s done in this town is through efforts of volunteers. Last year, Town Administrative Support Specialist Carolyn O’Connor, who’d previously organized the town’s annual Beautify Londonderry efforts, resigned from her position, and town officials decided against replacing her. Thanks to the efforts of community volunteers, though, Beautify Londonderry continued on last spring, 300 volunteers strong. Residents Stanley, Sadler and Pauwels stepped up to the plate to fill O’Connor’s shoes under the guidance of the town’s Solid Waste Committee. This year’s Citizen of the Year is the Rev. Bob Couto, pastor of St. Jude’s Parish. “We’re all going to have to go to confession, because we’ve been telling him all along that the award was going to (St. Jude’s parishioner) Carole Connolly,” joked former town councilor Joe Paradis, who presented the award to Couto. According to town Councilor Paul DiMarco, Couto has been serving his community for most of his adult life, taking on everything from assuring as many citizens as possible were on hand to see the high school band off to the Rose Bowl, to support of residents in the military and their families. “He’s offered his help to everyone, regardless of their religious affiliation,” DiMarco said. Couto appeared surprised to learn of his accolades. “This award really belongs to the people of this town and the people of the parish who have been so caring of so many of our brothers and sisters in need, and we have many,” he said. Departing town councilors Mike Brown and Paul DiMarco were likewise honored for their service Monday evening. Both were presented with desk clocks, pens and fleece jackets. Also recognized were several retiring committee members: Budget Committee members Don Jorgensen and Mark Oswald, Library Trustee Richard Matckie, Trust Fund Trustee Scott Knox, Elder Affairs Committee members Peg Johnson and Sandra Weston, Heritage Commissioners Deb Paul and Lara McIntyre, Planning Board members Cole Melendy and John Farrell, and Town Historian Marilyn Ham. Ham retired from her longtime post as town historian last year after relocating to Derry.